Venerable rock band AC/DC made news recently, not so much for their upcoming studio album Black Ice (coming Oct 20; expect more of the same), but for their exclusive deal with Walmart to sell their new album. Walmart, that most venerable of rock institutions, has (almost) exclusive rights to distributing the record, meaning that online music stores (Amazon.com, iTunes) and even other brick and mortar stores (Best Buy, Target) are left in the cold. Walmart? Exclusive Deal? Go ahead and cringe for a moment while you think about one of the greatest hard rock acts selling out in a big, big way. 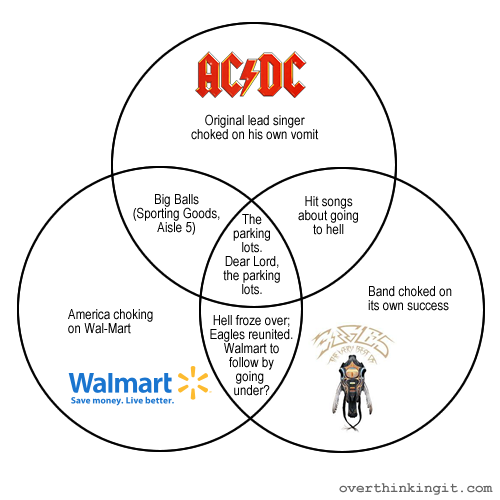 But are AC/DC and Walmart such strange bedfellows? No more so than The Eagles, who also made a similar deal with Walmart for last year’s Long Road Out of Eden. In fact, when you put the three together in an oh-so-dorky Venn diagram, the similarities among all three parties become quite obvious. Readers: can you think of anything else that lies in the intersection of AC/DC, Walmart, and the Eagles? Are Walmart and corporate greed (not exhaustion of the form) killing rock music? Got any great stories, or heaven forbid, fond memories from the parking lot of a Walmart store/Eagles concert/AC/DC concert? And what’s with that new Walmart logo? The AC/DC lot was the most white-trashy crowd I have ever seen. And I’ve seen Hank Williams Jr. Twice. After the show, we are walking back to our cars and see the tour buses parked behind the arena. The gate to them is open, so we slide inside. End up next to some older groupie looking woman, one who look like she inspired “The Jack.” She proceeds to tell us she gives “massages” to all the band members but Brian. But Malcolm was her man. She had been following the band around this tour, sleeping in the 18 wheelers with the band equipment. She literally slept with Angus last night. The giant 20 foot tall statue of Angus. She did tell us to stick around cause the real Angus would come out. He did, and signed autographs. He’s very short. Angus did not bring the groupie back to the bus. She would have to wait for Malcolm, we did not. I too met an older groupie looking woman who looked like she inspired “The Jack” at an AC/DC concert: 2001, Madison Square Garden, NY, NY. She was sitting behind me; we were somewhere in the nosebleeds. Before the band went on, she taps me on the shoulder and offers me a puff on her joint. I politely declined and went back to talking to my friend. Then, while the band played “The Jack,” they turned the camera that feeds the big screen onto the crowd and invited all the classy ladies to lift their shirts and display their goods to the crowd. There were few takers…except for, you guessed it, the woman sitting behind me. She tapped me on the shoulder, I turned around, she showed me her goods, and I turned right back around.